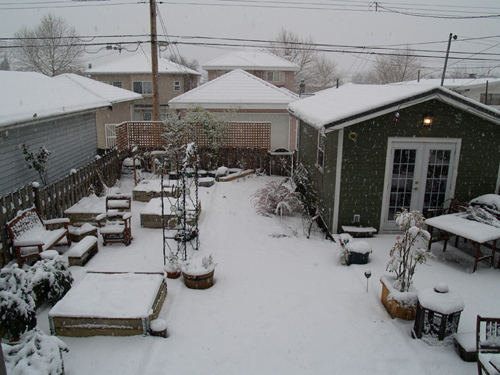 Our backyard - last week. Since this is supposed to be a garden blog, I suppose that every so often I should post about gardening and not just household improvements because the weather is bad. But really, after last week’s cold snap (-10 in Vancouver), the garden isn’t looking so hot. What with the slimy greens and the bald shrubs left behind by the melting snow. We’ve got one more round of leaf raking if the rain stops, and then all yard work should be pretty much wrapped up until early March. Though I am also thinking that because more cold weather is apparently coming I might re-mulch my berry bushes and herbs to increase chance of survival through what could be really frozen weeks. For the first time this year I planted a “green manure” legume mix in late September — idea being that some overwintering crops help to provide additional soil nutrients such as nitrogen. I’ve discovered that this is a much more attractive option than staring out at empty dirt patches all winter. The legume mix, in addition to the winter veggies make for some nice green in our raised beds to counteract the seasonal grey. As well, the Fava beans and garlic poking up are a nice reminder that spring and summer harvests will indeed come again. Winter of course is a time of garden dreaming — the months in which we pore over seed catalogues, envisioning beds of our favourite edibles and new experiments in the year to come. For me that process starts in January when I inventory my seeds and order what is lacking. This year though, I find my visioning beginning early as I start mapping out our front yard for revamp in the spring. In particular I will be curious to see how the lingon and huckleberry plants in our boulevard do over the winter — since I would like to plant more as hedging if my trial bushes do well. Of course that’s just the start! It looks like very soon (perhaps as early as this weekend) we will be seeing the start of another structure in the backyard — a gazebo covering the hot tub. Pictures to come! ← Frida in the hallway.